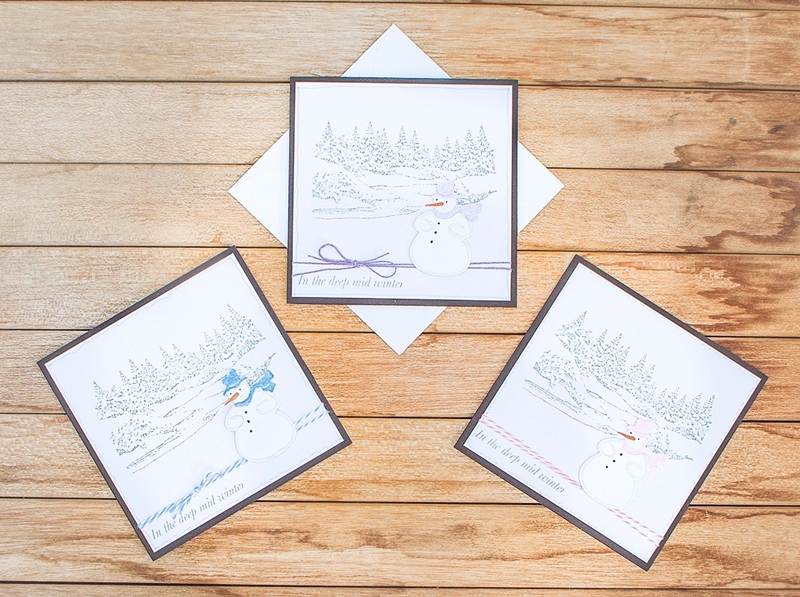 Three black cards, two different stamps, three die cut snowmen, lengths of lilac hemp twine*, blue and pink bakers twine*, a few colored pens and Stickles or glitter of your choice are the materials required for this card. The pine forest was stamped first in light grey ink on a square of white card, slightly smaller than the black card, and lightly covered with sparkly Stickles. The sentiment was stamped in the left hand corner. Twine was wrapped round the square and secured, then the snowmen were fixed in place with sticky pads. The snowmen’s’ hats were colored to match the twine and, finally, a squiggly border in grey was added before the white square was secured to the black card. Because the card used was black, a white page was inserted inside so the greeting could be hand written. 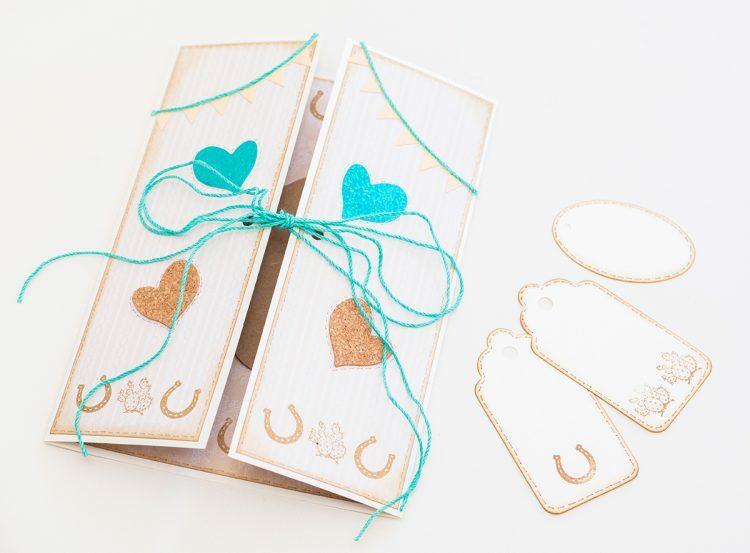 These cards can be made in any size and shape, depending on the materials to hand. *Twines available from Hemp Beadery. This is a quick and easy card to make if you are pushed for time or wish to make a batch all the same. 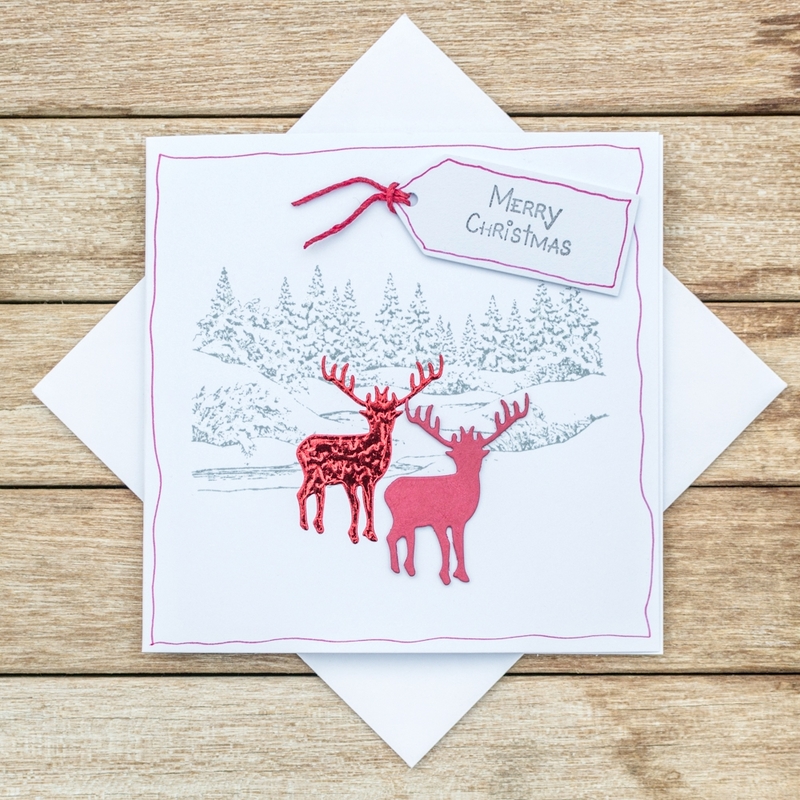 Stamp the pine forest in the centre of the card, lightly cover with Stickles or glitter of your own choice. Die cut two reindeer and fix in front of the forest. Draw a red line round the edge of the card. Die cut a white tag and stamp Merry Christmas or another suitable greeting on it, thread through a short length of red hemp twine* and fix to card with sticky pad. *Red hemp twine available from Hemp Beadery. 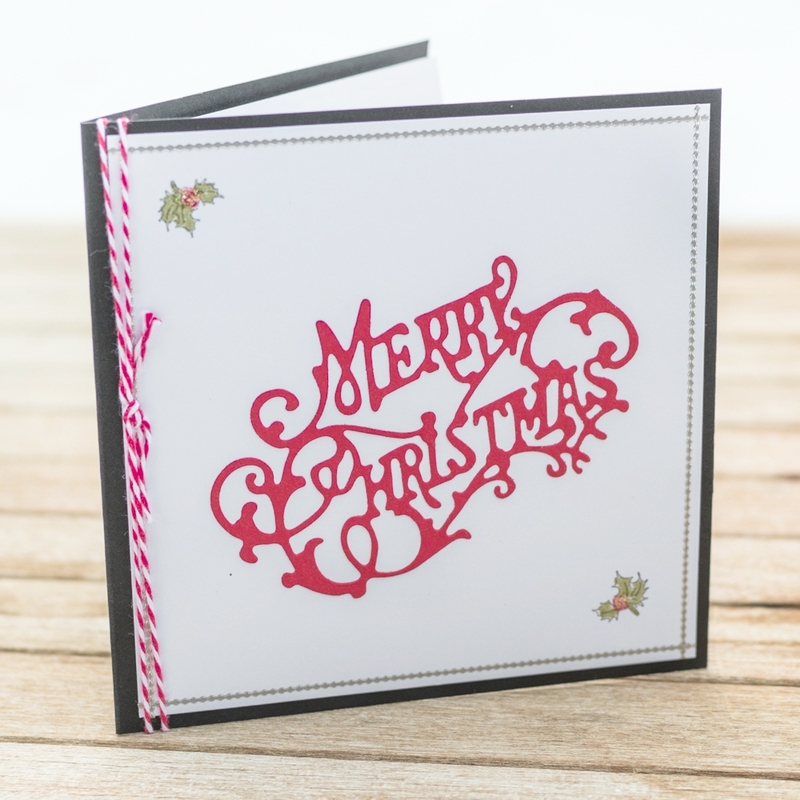 The red die cut Merry Christmas on white card says it all! We just added tiny stamped holly leaves in two corners, a little glitter on the red berries, and a silver border before fixing the white square to a black card. Red and white bakers twine* wrapped around the card and tied added the final touch. Bakers twine is ideal for use on greetings cards, being soft to handle and pink and white is a favorite of ours. Flowers were stamped on a square of white card, then colored in with watercolor pens. A little sparkle was added to each flower and the pink and white twine wrapped round the base, before the square was fixed with sticky pads to a white card. No sentiment was added so the card could be used for a variety of occasions. *Bakers twine available in several colors from Hemp Beadery. the end of the month, please! This gate fold card is the result. cacti were stamped in brown. of congratulations inside the card. 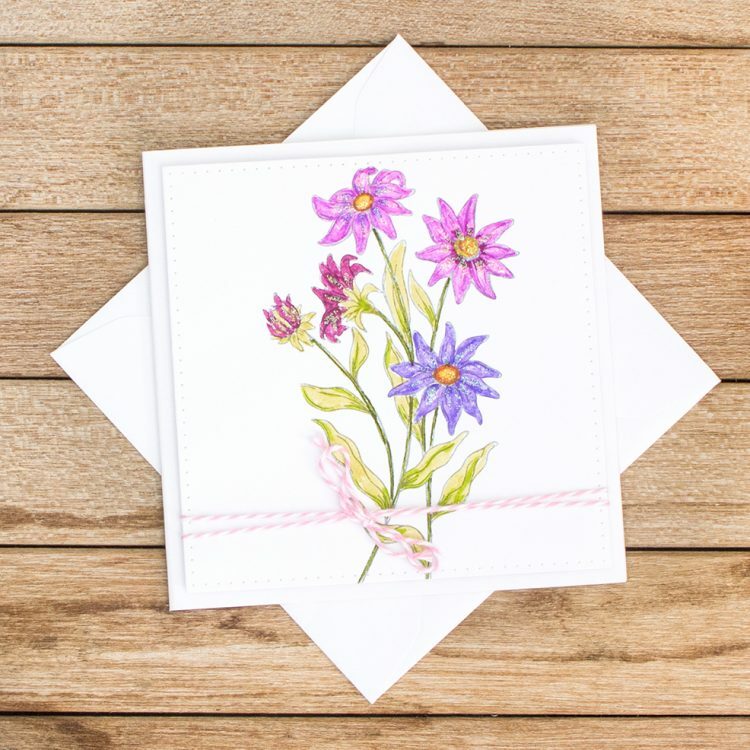 The flowers on this card are created by using a very wet paint brush to pick up watercolor and literally blob it in three places on a white card. When dry, draw a wiggly line from each flower head using a waterproof black pen. Draw in fun shaped leaves, paint lightly in green. Doodle centres and outlines. 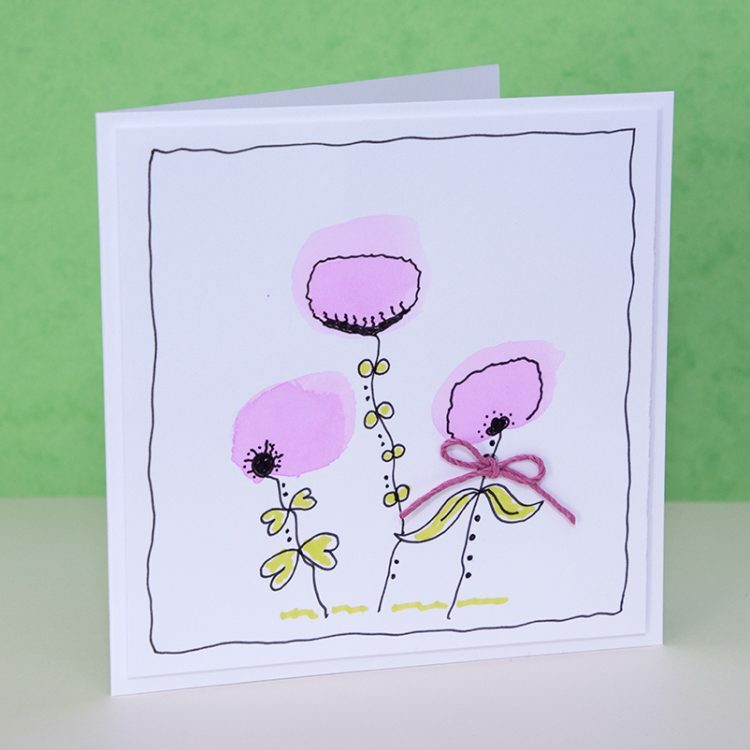 Tie a bow in a length of hemp twine and attach to a stem, then doodle a line around the edge of the card to finish. 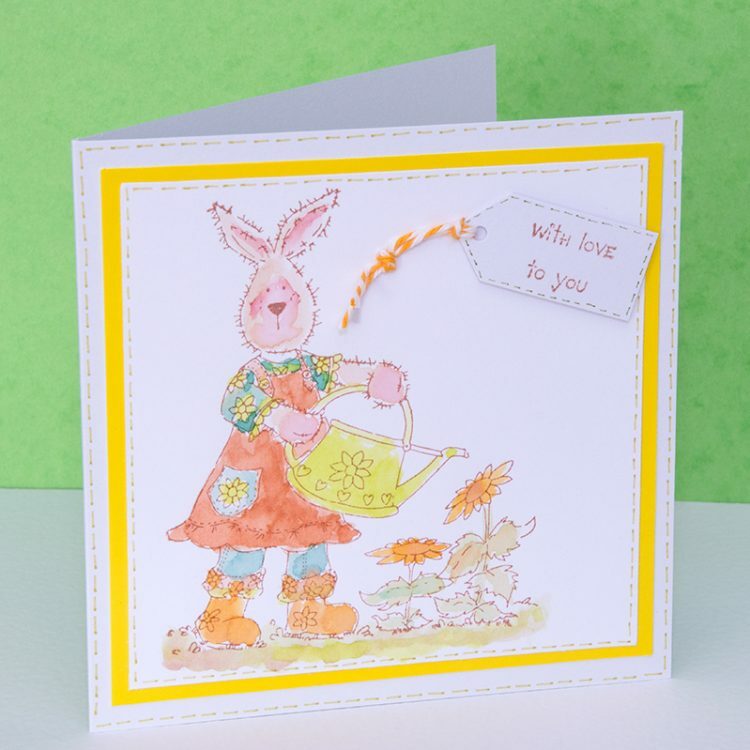 The female rabbit watering her garden was stamped in brown on a square piece of card and then painted with a variety of different makes of watercolour pens. The card was backed with bright yellow paper and fixed to a slightly larger square card. The sentiment ‘with love to you’ was stamped on a small tag with a small length of bakers twine attached. The tag and card were outlined with in brown faux stitches. 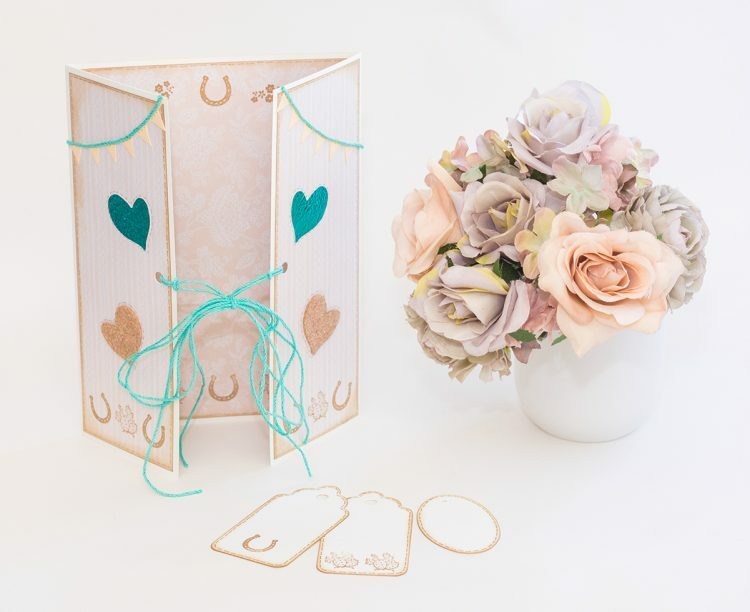 The background pattern for this card was made by randomly stamping small flowers and leaves in pastel colours onto a piece of white card, then cutting it into two triangles and fixing to the top and bottom corners of a rectangular card. 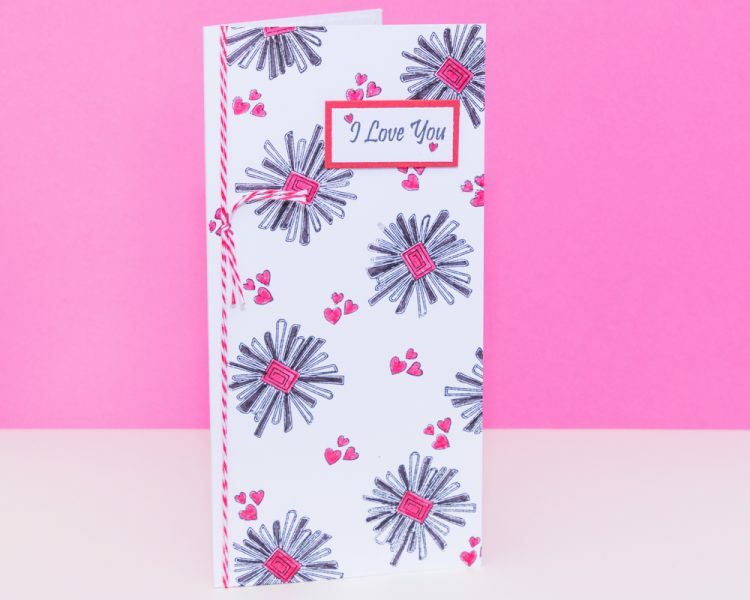 The words were stamped in pink, the card trimmed to size and the corners rounded with a corner punch. 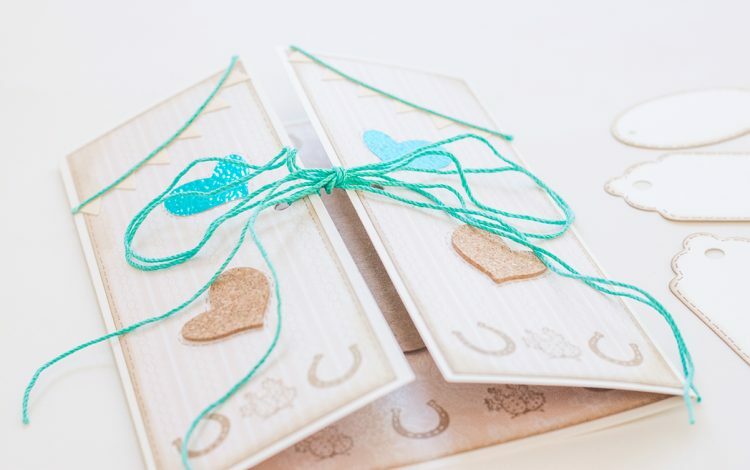 A piece of hemp twine was wrapped round the card and tied in a bow before attaching it to the centre of the card with sticky pads to give the card depth. A deep pink pen was used for the faux running stitches. Experiment with any small stamps you may have of your own, you will be amazed at what you create! If you enjoy stamping, doodling and coloring, then this card is for you! 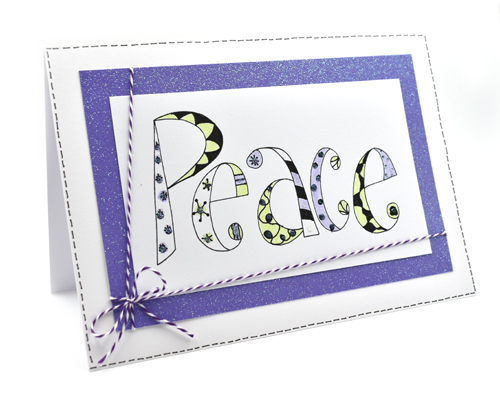 Stamp Peace in black ink onto the smaller piece of white card. With the fine black pen doodle a variety of patterns in each letter. Choose two or three different colored pens and color in the letters, leaving plenty of white showing. Attach this card to the backing paper with double sided tape, then wrap a length of bakers twine several times around the lower part and tie securely. Attach to the pre-scored card and with the black pen draw running stitches around the edge of the card. Finish by stamping a seasonal greeting inside the card. 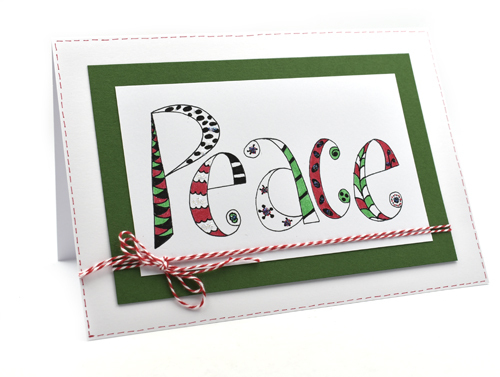 Although our card is a Christmas one, ‘peace’ is a greeting that can be used all through the year. It would look great in Rasta colors, too.